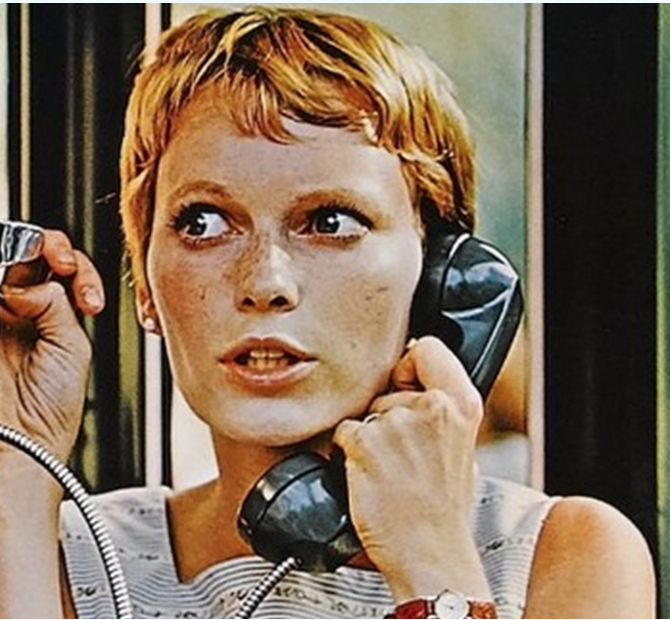 Rosemary’s Baby turns 50 today, and I’ve been thinking a ton about this film and about the genre of horror overall. For a few decades, dystopias were the alarm clock we all needed, but because the dystopia is now and no satire could possibly outstrip the grotesque burlesque that has capsized the highest chambers of the land, horror is the perfect lens for examining the greatest biases and ugliest fears prevailing in our dying (dead?) republic. That’s why Get Out blew everything else in 2017 out of the water, and that’s why films like The Exorcist and, yes, Rosemary’s Baby haunt us still. The former was about an America possessed–why else do you think it took place within spitting distance of Nixon’s White house?–and the latter was about the way that women are gaslit about everything including their own intellectual and reproductive powers. It’s also why I’m so flatly unimpressed by the emptyheaded Hereditary, the Toni Collette everything-and-the-kitchen-sink horror film that has everyone’s tongue a-flapping this month. Admittedly Collette, who often overcompensates for weak material, turns in a fascinating calibrated performance that is a career peak. But this is the psychologically scariest film I’ve ever seen that has no thesis, no greater point it’s driving home, no true coherence, nor character development. As a witch and magic practitioner, I was painfully aware that writer/director Ali Aster steered into a bevy of supernatural topics he didn’t adequately research or articulate. Has no one learned from the myriad deaths and tragic accidents associated with Spielberg’s clayfooted Poltergeist? Really, Hereditary is a fantastically executed failure that I don’t regret seeing but never need to see again. If you’re going to scare the bejesus out of us these days, there’s plenty of real American Horror Story to draw upon. Director Roman Polanski, for all his insanity about women and sexuality, nailed the putrid plight of the twentieth century woman, and, let’s face it, 21st century women too. Besides its unparalleled aesthetics–young Farrow alone!–that liberationist rage is why I clamor to the film again and again. Here’s the related essay I wrote for the film’s less austere 47th anniversary.